A little while ago Office 2013 released its Service Pack 1 and I explained where to download the Service Pack. On your Windows RT machine there was no option to download an installer to update Office 2013 like you do on a regular Windows machine so I added an additional post to explain how that is done. Office365 or other subscription based Office installations are also a bit different than the other installations to update your installation. These installations are mostly offered using the so called C2R installations where C2R stands for “Click-to-Run” installations. C2R installations are completely different than MSI installations, you can read more about it here. So how do you update a subscription based Office installation? When using Office 2013 as part of a subscription the service pack is not offered via Windows Update or standalone installer. In this post I will show you this other installation option: how to install your Service Pack 1 on a subscription based Office installation in the steps below. 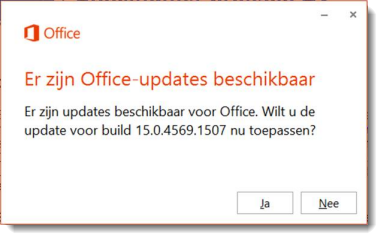 Again, for kicks I show you the here -Dutch- message box, not much different than the English one however … it told me there are Office Updates available and asks me if I wanted to install the update now. Click Yes to continue installing the Service Pack 1 from here. Confusing? A little bit if you ask me, especially if you are like me and have several different options to facilitate, but I guess most people just have one or two of these options in place. 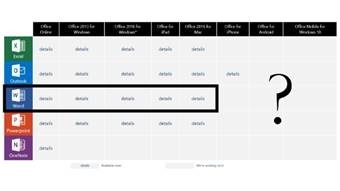 It seems that over time more and more people will shift to the subscription based option either in the context of Office365 or the Office Home program where you get five installations on a ‘family’ subscription for under hundred dollar a year. Supposedly a spin off from the BBC series this is an animation feature where the viewer is brought back to the time on earth when Dinosaurs were around. 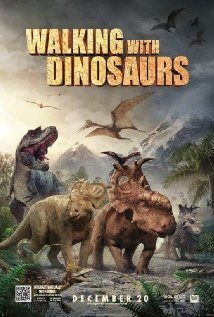 I went to see this movie with my ten year old son and besides entertaining it probably also provided some learning moments as the movie explained some details around the existence of the Dinosaurs, differences between the various species and their natural enemies. As said, the movie was entertaining, some humor added and 3D effects on top to make it more impressing. Personally I like the ‘fun’ animation features like the Ice Age series a bit better that the more realistic animation feature like this one but I got the impression that for kids it was entertaining enough to earn a minimal Seven out of Ten. 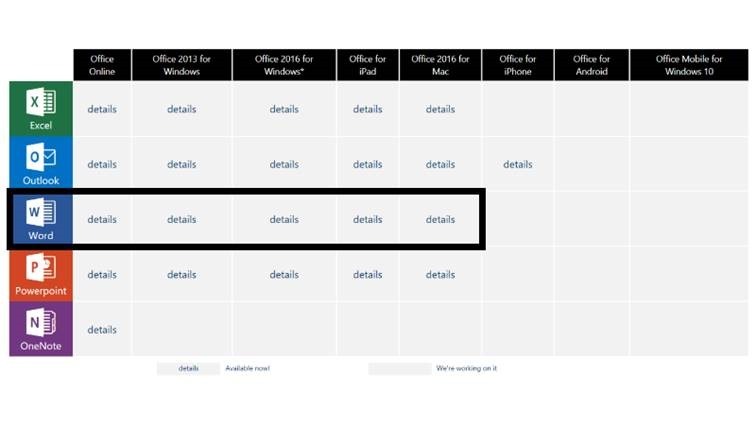 In my previous post I published the fact that Office 2013 just had just released their Service Pack 1 and explained where to download the Service Pack. On your Windows RT machine however there is no option to download an installer to go ahead in updating Office 2013 like you do on a regular Windows machine. How would updating be provisioned on Windows RT? That’s it … you only need to reboot after installing the update and you are good to go to work with your fresh updated Office 2013 RT. This movie does not lack the big names to bring it to a success story, but is that enough? The story is all about a ‘gang of four’ being friends since childhood. They are now well over sixty and Billy (Michael Douglas) decided to take a shot and marry a thirty year or so younger girl and calls his buddies to arrange a bachelor party in Las Vegas (where coincidentally this week is the big SharePoint Conference 2014). Things never have been very smooth between Paddy (Robert de Niro) and Billy. I won’t go into details to avoid spoiling the plot in details so take this for a fact. The four friends Billy, Paddy, Archie (Morgan Freeman) and Sam (Kevin Kline) need to solve things around this issue. It’s an old men movie, kinda slow and the ‘big names’ in the movie aren’t making it much better. Events are somewhat predictable and won’t give you the thrills you would expect from the title “Last Vegas – It’s going to be legendary”. It wasn’t that legendary if you ask me. Six out of Ten. 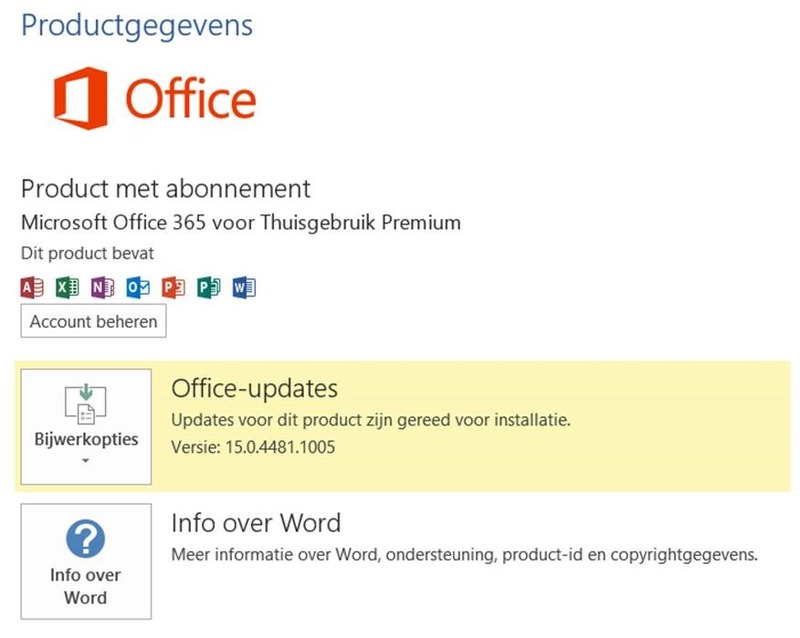 Microsoft just released the first Service Pack (SP1) for Office 2013. As an Office SME, I have been developing solutions and worked with the product since the early versions waaaaaaaaaaaaaay back years ago, I’m always interested in what is going on in that area. Getting information from the Office developer/development team is not easy these days, in fact … it never was… It has been a bit better, at the time they used to have Office Developer Conferences, in early years you even only were allowed to attend on invitation. The Office team is not one of the teams that shares a lot of information before going public on things. The Developer Division is completely the opposite and shares information whenever they can. In my opinion a much better way to work with your customers, get early feedback and make sure you stay on track – keep the train on the rails your customers are on. I know the Office team is just huge and also know the SharePoint Conference is targeted as replacement for the Office Developer Conferences but there is a huge difference between client applications such as Word, Excel, PowerPoint, Access and many more and SharePoint. SharePoint is mostly a Server environment. Besides a cumulative rollup of previous fixes released earlier, up to approximately somewhere around January, it also include a whole slew of other fixes found in the product. Enjoy your updated Office Suite, it just got to be a little bit better than it already was … Let me know what you think about it in the comments! Free Birds, an animated feature about Reggie the Turkey. He found that turkeys are there to be sacrificed and be the Thanksgivings dinner star. He tried to warn his fellow turkeys but ends up as the annual Pardoned Turkey living in wealth and luxury. Until he meets Jake, or rather Jake finds him, the two of them travel back in time to 1621. The story evolves and allegedly history of Thanksgiving is visualized. A movie with lots of humor for kids but also entertaining enough for adults. I enjoyed watching the adventures of Reggie and Jake with my daughter on the big screen (no, there are no extra credits for that) so Seven out of Ten. Last year I attended Build 2011. It was highly secretive and more or less Apple-ified kind of conference held by Microsoft however this time. No one knew what to expect other than that Microsoft planned to make a big shift in their plans for the upcoming years. As I blogged about it last time, it seemed that Microsoft decided to align all products with the same type of User Interface and able to run on most devices from phones to data servers. One of the big announcements was that Windows would be able to run on ARM processor based devices and would be prepared as touch enabled Operating System. Tomorrow, Eight-Eight-Eight (8-8-8, August 8th at 8AM) it will happen again. Microsoft is opening their doors this time on Microsoft Campus in Redmond, not in a fancy location with Disneyland or Vegas setting but ‘just’ at Microsoft’s home base. Again, no-one knows what to expect and what to arrange for traveling and lodging but I’m pretty sure it will provide a lot of interesting information and options to build your network for the next year or so. Build 2011 provided insights in completely new areas and was definitely worth attending. In general I am an autodidact, the reason often is that I am learning the things that I ‘predict’ to be big in the -next- couple of years and a lot of it is simply not available soon enough. Living on the bleeding edge. Events like Build are different, mainly because the speakers on the conference -are the developers- working on the new technologies. Not some consulting guys but the ones who designed it. So, it won’t take more that 24 hours until we know what it’s all about. Or maybe not … maybe you only know how to register and where to stay. That was what happened last year. No information at all. For me I’ll try to register and see if I can get a ticket to learn what to focus on the next couple of years. Maybe my boss is willing to sponsor me, maybe not -in that case I’ll break my piggybank and will it be my early Christmas vacation- but the ones who get in will be the ones with the Golden ticket …. 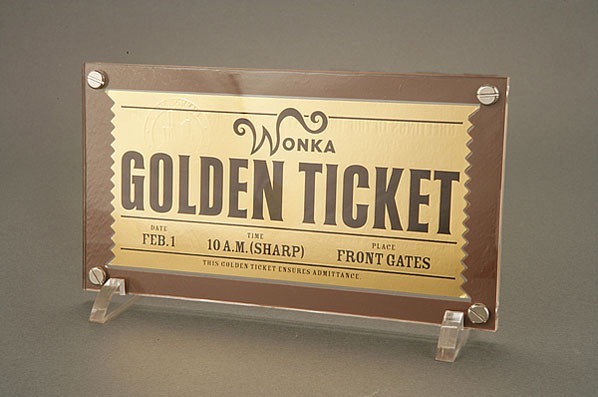 Let me know, are you trying to get registered, to get the Golden Ticket …?